I know a recipe is a keeper when I start writing the blog post in my head before I’ve even finished eating. 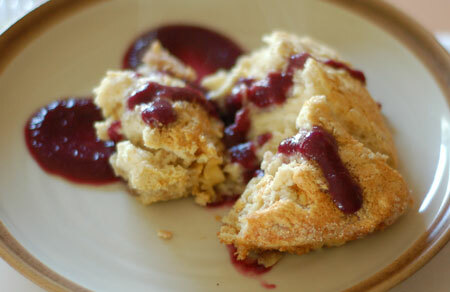 Last night I saw Liv Life’s post about oatmeal souffle on Foodbuzz, and mentally filed it away for a future breakfast. Turns out I didn’t have to wait long to try it out, because Jeremy unknowingly suggested oatmeal for breakfast today. Nolan is less than enthusiastic about oatmeal in its basic state, but I thought he might give it another chance if I souffled it. I’ve made a few souffles before—namely goat cheese and carrot—but never a sweet souffle, amazingly enough. Either direction you go, they essentially comprise a flavored custard base, enriched with egg yolks, into which stiffly beaten whites are folded for lift. A fluted ceramic souffle pan, while helpful in getting the coveted height, is not strictly necessary; I used a small casserole dish that was more appropriately sized than my souffle dish, and buttered and sugared the walls to give my souffle a better grip. I also made sure not to use my oven’s convection feature in this case. The recipe at Liv Life is a healthified adaptation of one from Marion Cunningham’s Breakfast Book, which has been on my Amazon wish list for like five years. I took the liberty of bringing our souffle back a little closer to the original, full of sugar and fat, partly because I didn’t want an orphaned egg yolk rattling around in my fridge and partly because one egg, less than a tablespoon of butter and a few tablespoons of sugar per person does not seem so very extravagant to me. I also used some homemade ricotta that needed using up in place of the cream cheese. I omitted the walnuts and raisins, but while it baked, I simmered some diced pear and frozen blueberries with splashes of maple syrup and lemon juice for a quick sauce. 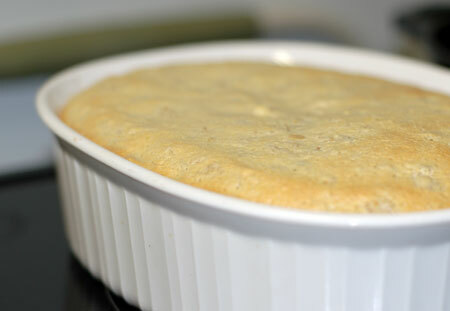 The souffle came out nice and light, actually much more so than I expected given the heaviness of your standard oatmeal. I found the texture just a little odd, since it combined the airiness of a souffle with the bite of our extra-thick rolled oats. With the original 1/2 cup of sugar, it was definitely on the sweet side, but we found that the pear-blueberry puree I made added a fresh tang that balanced it out beautifully. Jeremy inhaled his first portion and went right back for seconds, and even better, my toddler cleaned his plate, which makes this recipe an out-and-out hit in my book. Probably not an everyday breakfast, but certainly an excellent change of pace! Preheat oven to 325ºF. Butter a 1 1/2 cup soufflé dish or casserole, and sugar the sides with granulated sugar. Place the milk and butter in a saucepan and heat until barely boiling. Add the oatmeal, reducing heat to low and stirring often until oatmeal is thick. Remove from heat and add the cream cheese or ricotta, salt, brown sugar, nutmeg and cinnamon. Whisk until mixture is smooth. Beat 3 egg yolks slightly, temper them with a small amount of the oatmeal mixture, and slowly stir them into the oatmeal. Mix in the raisins and walnuts, if using. Beat 3 egg whites until stiff, but still moist. Gently fold the egg whites into the oatmeal mixture, being careful not to deflate whites. Fold only until no large lumps of whites remain. Spoon the mixture into the prepared soufflé dish; run your thumb-tip around the edge of the dish to create a small channel around the souffle base, which will encourage it to rise straight. Bake for 35-40 minutes or until the soufflé is set but the center still trembles. 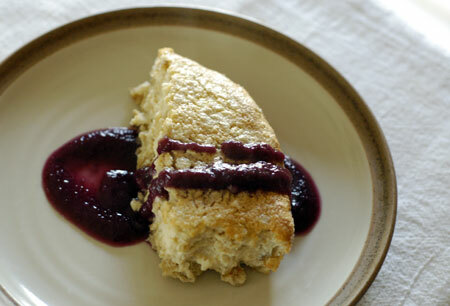 Serve immediately, either with milk as you would ordinary oatmeal, or a pool of pear-blueberry sauce. Source: Adapted from Liv Life. Your version look simply amazing!! I’ve copied it and will be trying it soon. I know my daughter will be thrilled with the return of the sugar! Your description was spot on… airy but with the heaviness of the oats. I found it surprisingly good as well, though not exactly what I had expected. Love your topping… and I have to say your plating is nicely done! I was drooling over Kim’s version, too. I love how yours turned out. What a great breakfast for the kids. I loved liv life’s recipe and I love yours, too… you both did an incredible job! That sauce looks really good! I hope this convinces you to move the Marion Cunningham book from wish list to order. 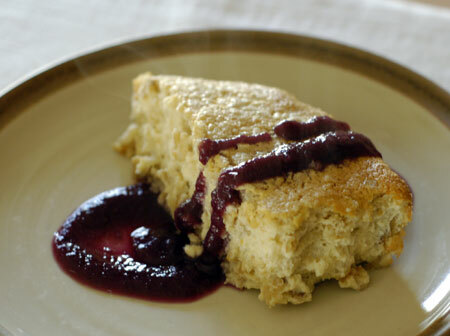 Then you can make oatmeal souffle and the best cream biscuits, the best waffles…. I made it with a single serving of oatmeal, using one egg separated and a teaspoon of brown sugar. I baked it in a small ramekin in our toaster oven, and it came out beautifully! I have made this recipe over and over and over again. Thank you so much!! You are most welcome, Christine! And thank you for reminding me of this recipe, which I haven’t made for my family in several years… time to put it back in the rotation, methinks!